Indira Gandhi captured the hearts and minds of Russians in a way that very few foreign leaders ever could. November 1st is a day that brings bad memories for Irina Kriminetskaya, a teacher in the small town of Bikin in the Far Eastern Khabarovsk Region. It was precisely 27 years ago on that day when she saw the news on state television of then-Indian Prime Minister Indira Gandhi’s assassination at the hands of her bodyguards. Being 7 hours ahead of Moscow time, Kriminetskaya like many others in the Russian Far East came to know of the assassination a day late. “I dropped the glass I was holding on my foot and I needed stitches,” the 55-year old says. “I wasn’t aware of India’s internal politics and so this news was a completely shocking.” Mrs Gandhi was shot dead by her Sikh bodyguards who wanted to avenge her decision to storm the Golden Temple, Sikhism’s holiest shrine, to flush out militants. “She was a role model for women everywhere,” Kriminetskaya says. For the Soviet Union, which was at the forefront of promoting women’s rights, the charismatic daughter of Jawaharlal Nehru was a poster-child. “She was popular all across the USSR,” says Nele Renser, an Estonian Indologist who saw the Indian Prime Minister during her visit to Tallinn in 1982. Unlike present-day Indian leaders who spend less than 48 hours on visits to Russia, Indira Gandhi visited quite a few Soviet cities as this gallery from RIA Novosti indicates. “The Soviet Government respected her for the fearless attitude and leadership,” says Renser, who spends a few months every year on academic assignments in India. “Although India didn’t outright condemn the Soviet invasion of Afghanistan, Indira Gandhi tightly rapped the Soviet leadership on their knuckles,” adds Renser. Such was Mrs Gandhi’s popularity in the former Soviet Union that many parents in central Asian countries named their daughters Indira. The name continues to be popular in Kazakhstan, almost 6 decades after Mrs Gandhi accompanied her father on a half-day trip to Almaty. 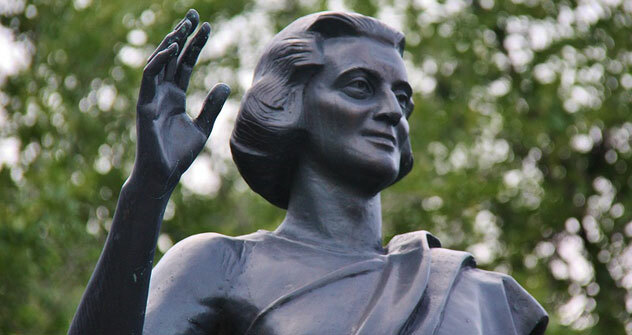 While many cities across the world have statues of Mahatma Gandhi and streets named after Jawaharlal Nehru, Moscow was the first international city to erect a monument in honour of Indira Gandhi. The statue was installed in 1987 at the Gandhi Square (next to Mahatma Gandhi’s statue) at the intersection of Lomonosovsky and Michurinsky avenues near the Moscow State University and was a Soviet tribute to the leader in the wake of the assassination. The statue was the work of Oleg Komov, a famous Soviet sculptor. Back home in India, debates on Indira Gandhi’s legacy are heated and highly disputed by her admirers and detractors. Few, however, can fault the leader for her foresight when it came to the August 1971 Indo-Soviet Friendship Treaty, which all but guaranteed, Soviet help in future conflicts. Less than half a year later, India was at war with Pakistan to liberate Bangladesh and the Soviet support played a crucial role in the war. Mrs Gandhi possessed a quality that many of her successors seemed to lack: the ability to take decisions, no matter how difficult they were. The impact of Indira Gandhi’s warm political relations with the Soviet Union can be felt to this day. Earlier this year, Russia’s ruling party, United Russia signed an agreement with the Indian National Congress (the party that Mrs Gandhi led) to enhance cooperation. The seven-point agreement envisages cooperation in the fields of party development, organisational work, supervising and auditing activities. There’s no politics, however, in the way India’s own ‘Iron Lady’ is remembered in Russia, almost three decades after her assassination. Every year on October 31 in St Petersburg Larissa Levochkina and 3 friends, who were admirers of the late-Indian Prime Minister, raise their glasses in toast to Mrs Gandhi after observing a minute of silence in her memory. A ritual similar to the one followed by Irina Kriminetskaya, 7 time zones ahead in the other end of Russia.